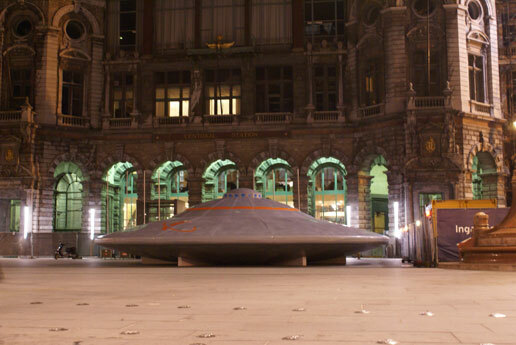 This flying saucer showed up in front of Antwerp's Central Station one morning in mid October 2007. An Internet search revealed that several people had seen and filmed a strange blue light over the city earlier that same month. However, closer inspection revealed a rather clumsily build craft resting on wooden beams, while the photographic evidence was obviously computer generated. A Saturn-shaped logo on the hull of the "craft" confirmed that this was neither a true UFO, nor a work of modern art: the saucer turned out to be part of a publicity stunt for a German electronics chain store which was to open its doors on October 25th in a renovated prestigious building on Antwerp's busiest shopping street. See also next picture for a view from a different angle.